Having bought only Leyland 'Titan' models for its double deck bus fleet, No. 64 (following identical No. 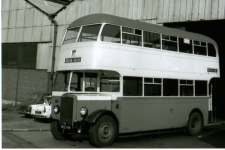 63) was the last Leyland to join the Lincoln fleet before Leyland's transfer to military production led to Guys becoming Lincoln's standard double deck chassis during and shortly after the war. Some uncertainty surrounds this pair of buses - the outbreak of war in 1939 leading to cancellations of orders, and restrictions being put on the availability of materials. It is understood that Lincoln had ordered 4 Leyland bodied TD7s in 1940 - following earlier batches of Leyland bodied Titans - and 4 registration numbers were reserved. It is known that No. 64's chassis was built during 1940. The engine is a diesel unit of 8.6 litres which develops 98 bhp at 1900 rpm and is matched to a 4-speed constant-mesh gearbox giving a top speed of around 35 mph. 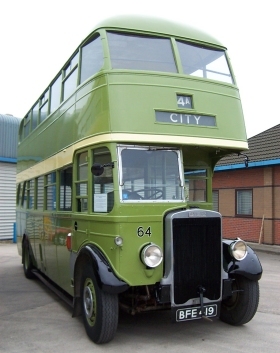 63 and 64 were completed in February 1941, entering service in a modified version of the pre-war bus livery (with a green roof instead of the pre-war white roof which would have been highly visible from enemy aircraft) and with masked headlamps and white edges to the mud-guards to improve visibility in the 'blackout'. These buses started a long association between Lincoln Corporation and Roe which lasted until the last Leyland Panthers were delivered in 1970. The 'pre-war' livery including three, black-lined, cream bands was replaced at some point in the late 40s by the 'single cream band' livery it currently carries. A further repaint in the late 50s saw No. 64 receive the 'broad cream' livery that is represented in our fleet by No. 23. No. 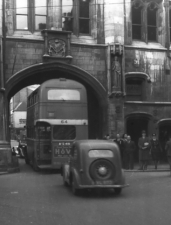 64 in post-war livery passing in service under Lincoln's historic Stonebow in the High Street - this has since been pedestrianised. LVVS Collection, photographer unknown No. 64 in 'broad cream' livery outside the Brayford exit of the Corporation garage. Photo courtesy of Bristol Vintage Bus Group. No 64 was withdrawn after 20 years service and purchased for preservation by F V LeTall, one of the Society's founder members, and was bequeathed with the rest of his collection to the Society. It received a repaint in 2004 courtesy of a grant from the Lincolnshire County Council Heritage Fund, and assistance from Lincolnshire Road Car. A "Higgs for Lincoln Imp pipes" was added on the rear - well known around Lincoln in its day. October 2010 - No. 64 is now receiving attention to the engine and cab wiring and an oil change etc is due soon. January 2011 - The rewire is well on the way to completion. July 2015 - A water leak has been diagnosed as coming from the engine water gallery covers where the aluminium was badly corroded. These have been replaced with locally manufactured parts, the fitting of which was not easy matter.